"CONTRACTORS WHO COMMIT TO PRIVATE LABELING NEVER LOOK BACK"
Private labeling makes it impossible for homeowners to lure contractors into a reverse auction for the sale and installation of the identical products using the same brand. Private label companies build brand equity that carries a tangible value when it's time to sell. A company's brand is the only brand you own, the only brand that can't be taken away, and the only brand that can't be offered to a competitor. 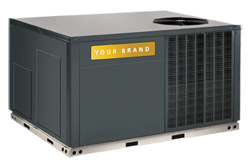 When consumers look at the brand name on a furnace or air conditioner and see the private labeled name (and phone number and website) it's natural to call the name on the box. Private labeling locks customers in for the life of the product, no matter who happens to own the home. ts because they are no longer paying for manufacturer brand building, dealer meetings, and incentive trips. The savings fall to the bottom line.